Chocolatier Helen Staines has transformed what was once a sweet hobby into a flourishing business and art form. Popping into the Sherbrook Street chocolate shop Decadence Chocolates is a delight for the senses. The heady aroma of freshly baked chocolate chunk cookies drifts through the air as loyal chocoletes browse shelves of colourful cacao creations, happily picking up a freshly brewed cup of coffee and a selection of bite-sized confections to go. 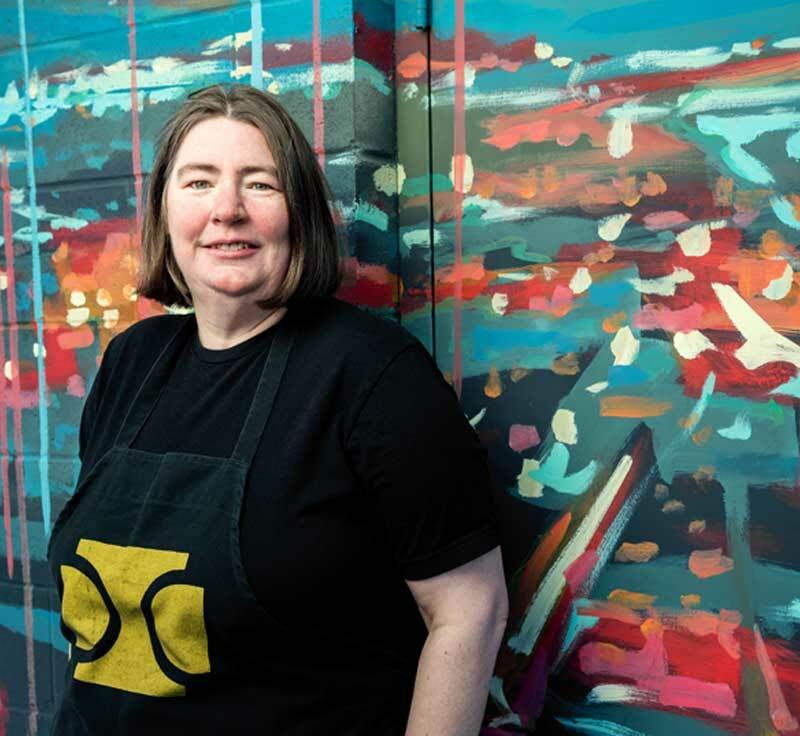 Hard at work in an open kitchen is owner and top-notch chocolatier Helen Staines, who has established well-earned popularity substantiated by a steady career of hospitality and event management in various kitchens, restaurants, pubs, hotels and cruise ships. The pursuit of Decadence is a serendipitous story that began in 2001. With no set plans for employment, Helen decided to journey from Yorkshire, England to Vancouver, BC. A stopover in Winnipeg on her way to the west coast brought about a sudden change of plans as the British émigré instinctively knew she belonged in Winnipeg. To increase her knowledge of all things chocolate, she enrolled in Ecole Chocolat’s online course in 2010 to study the history, the handling process, and decorating techniques. The first of many studies, she continued refining her craft in the essential technical art of bon bons – glazing, hand-dipping, molding, and tempering – while attending a short confectionery course at Callebaut Institute, the chocolate academy in St. Hyacinthe, Quebec. In 2014, while working full-time at Fort Garry Hotel as Conference Services Manager, she began increasing her chocolate repertoire and selling her wares at local craft sales such as Third + Bird. With a growing edible portfolio and positive feedback from customers, the decision to switch to a part-time job as an event planner helped focus more time on excelling in chocolate making, marketing the creations, and building clientele. A year later, she knew the need to acquire more knowledge on how to build a business – from marketing to financials – was paramount. The decision to seriously attempt “a go with entrepreneurship” was followed by enrolling in a business plan writing course at the Women’s Enterprise Centre by the summer of 2015. With a business plan intact, the next step was to seek out retail space in the West Broadway neighbourhood. That was the easy part. The challenges of developing an artisan chocolate shop in the middle of the prairies went beyond conscientious study and practice. Persevering through trials of building out a storefront: finding contractors, dealing with permits, and finalizing health authority paperwork; was compounded by the unfortunate accident that took place when painting the new interior, that inhibited her ability to walk. Having missed the original deadline to open on Valentine’s Day, the doors to Decadence Chocolates finally opened on March 1, 2016. A deep knowledge of traditional chocolate making techniques – combined with the perfect marriage of taste, colour, and creativity – involves a delicate state of equilibrium. Known to meld unusual, surprising flavours with incredible decoration – many which are hand-painted by Helen – can be inspired from the pairing of cereal with milk chocolate, a hint of curry, or light syrup of a treacle tart. The Banoffee truffles, another popular specialty, is based on a favourite UK pie made with bananas and dulce de leche cream. Visiting other chocolatiers around the world also proved to be an eye-opening comparison of blends and tastes that reflect global culture. “Travelling abroad and eating at restaurants offers a wonderful opportunity to discover combinations that spark my interest,” says Helen. To offer balance, piquant centres such as her famed truffles infused with lavender, honey, or thyme, may be selected to counterbalance a saccharine outer chocolate shell. Helen translates her winsome spirit and sense of humour with each free-form figurine and hand-painted chocolate – such as the pink chocolate piggy bank (named Smash), who watches over each customer that visits the shop to sample and purchase. Celebrating the second anniversary of business for Decadence Chocolates in March, Helen is deeply grateful. And when the expert behind the counter feels like a kid in a candy store, it’s certain her customers will, too.